Birthplace : Brookline, Massachusetts, U.S.
John F. Kennedy was the thirty-fifth president of the United States. He was the first president to reach for the moon, through the nation's space programs. He also was the first president since Theodore Roosevelt (1858–1919) with whom youth could identify. He made the nation see itself with new eyes. His assassination shocked the world. John Fitzgerald Kennedy was born in Brookline, Massachusetts, on May 29, 1917. He was the second son of nine children born to the multimillionaire business executive and financier Joseph P. Kennedy (1888–1969) and his wife, Rose Fitzgerald Kennedy (1890–1995). Joseph's father had served in the Massachusetts Legislature and in elective offices in Boston, Massachusetts. Rose's father, John Francis Fitzgerald (1863–1950), had been a state legislator, the mayor of Boston, and a U.S. congressman. Joseph himself had served as chairman of the Securities and Exchange Commission, chairman of the U.S. Maritime Commission, and ambassador to Great Britain (1937–40). Thus, the Kennedys were a wealthy family with a history of political and public service. Kennedy attended the Canterbury parochial school (1930–31) and the Choate School (1931–35). One of his teachers later said that people in school liked him more for his personality than for his accomplishments. He was often ill during his childhood and spent much of this time reading. Kennedy enrolled at Princeton University in 1935 but illness soon forced him to withdraw. Upon recovery he went to Harvard University, where he majored in government and international relations. During his junior year at Harvard, he traveled in Europe and observed the events that were leading to World War II (1939–45; a war in which the Allies—France, Great Britain, the Soviet Union, China, and from 1941 the United States—fought against the Axis powers—Germany, Italy, and Japan). He used his observations for his senior paper, which later became the bestselling book Why England Slept (1940). After graduating from Harvard with honors in 1940, Kennedy went to Stanford University for graduate studies. In April 1941 he tried to enlist in the U.S. Army but was rejected for physical reasons (a back injury received while playing football). Months later, after his back strengthened through a regimen of exercises, the U.S. Navy accepted him. He then became an intelligence officer in Washington, D.C. After the Japanese attack on Pearl Harbor, a U.S. Navy base in Hawaii, on December 7, 1941, the United States entered World War II. Kennedy requested active duty at sea and was given this assignment in late 1942. Following Kennedy's training with the Motor Torpedo Boat Squadron, he was shipped to the South Pacific to fight in the war against Japan. In March 1943 he was given command of a patrol torpedo (PT) boat, a small, fast boat armed with weapons, including torpedoes. In August his boat was sliced in two by a Japanese destroyer and two of his crew were killed. Kennedy and four others clung to the half of the PT boat that remained afloat. Six other men survived in the nearby water, two wounded. In a three-hour struggle Kennedy got the wounded crewmen to the floating wreck. When it capsized, he ordered his men to swim to a small island about three miles away. He towed one man to shore in a heroic five-hour struggle. Several days later, having displayed great courage, leadership, and endurance, Kennedy succeeded in having his men rescued. Returning to civilian life, Kennedy did newspaper work for several months, covering a United Nations conference, the Potsdam Conference, and the British elections of 1945. However, coming from a family devoted to public service, Kennedy desired a career in politics. In 1946 he became a candidate for the U.S. House of Representatives from the Massachusetts eleventh congressional district. Kennedy built a large personal organization for his campaign. On whirlwind tours he met as many voters as possible. He talked to the people in a direct, informal style about the topics that they were concerned with. In this campaign and in all the others, his brothers, sisters, and mother supported him. His brothers, Robert (1925–1968) and Edward (also called Ted; 1932–), acted as his managers, while his sisters and mother held social events to raise money for his campaigns. Kennedy won the primary, the fall election, and reelection to the House in 1948 and again in 1950. He worked for better social welfare programs, particularly in the area of low-cost public housing (or affordable places for people to live). In 1949 he became a member of the Joint Committee on Labor-Management Relations. In this capacity, Kennedy was a strong supporter of labor, working for higher wages and better working conditions. Kennedy supported the domestic programs of President Harry Truman (1884–1972), including social welfare programs, progressive taxation, and regulation of business. However, he did not follow Truman's policies in foreign relations. For example, he was against the fighting in Korea "or any other place in Asia where [the United States] cannot hold our defenses." In April 1952 Kennedy ran for a seat in the U.S. Senate against Henry Cabot Lodge, Jr. (1902–1985), a Republican liberal. Kennedy won by over seventy thousand votes. Lodge reeled under the impact. He had not run against a man, but a whole family. The Kennedy women alone had acted as hostesses to at least seventy thousand Massachusetts housewives. In 1958 Kennedy was reelected to the Senate. Kennedy's political success was soon followed by high points in his personal life. On September 12, 1953, Kennedy married Jacqueline Lee Bouvier (1929–1994), daughter of a New York City financier, at Newport, Rhode Island. Arthur M. Schlesinger, Jr. (1917–) noted that "under a veil of lovely inconsequence" Mrs. Kennedy possessed "an all-seeing eye and ruthless judgement." John and Jacqueline Kennedy had three children: Caroline Bouvier (1957–), John Fitzgerald (1960–1999), Patrick Bouvier (who lived only a few days after his birth in 1963); another child was stillborn in 1956. Taking his Senate seat in January 1953, Kennedy continued to support key labor, economic, and foreign relations issues. He served on the Labor and Public Welfare Committee, the Government Operations Committee, the Select Committee on Labor-Management Relations, the Foreign Relations Committee, and the Joint Economic Committee. He also worked to pass several bills to aid the Massachusetts fishing and textile industries and to improve New England's economy. A recurrence of his old back injuries forced Kennedy to use crutches during 1954. An operation in October 1954 was followed by another in February 1955. He spent his months of illness and recovery writing biographies of Americans who had shown moral courage at difficult points in their lives. These biographies became the best-selling book Profiles in Courage (1956), which won the Pulitzer Prize for biography in 1957. Kennedy's back operations were not completely successful, and he was never again entirely free from pain. After recovering from his operations, he returned to his Senate seat in May 1955. He became a strong supporter of civil rights and social welfare legislation. The Kennedy-Douglas-Ives Bill (1957) required an accounting of all employee pension and welfare funds. Kennedy also sponsored bills for providing federal financial aid to education and for relaxing U.S. immigration laws. Kennedy's record in elected office and the books and articles that he had written attracted national attention. After he lost the vice presidential nomination at the Democratic National Convention in Chicago in 1956, he decided to run for president. Formally announcing his candidacy in January 1960, Kennedy made whirlwind tours and won the Democratic primaries in New Hampshire, Wisconsin, Indiana, Ohio, Oregon, Maryland, Nebraska, and West Virginia. On July 13, 1960, Kennedy was nominated for president, with Lyndon B. Johnson (1908–1973) as his running mate. "Jack in Walk" shouted the Boston Globe after Kennedy's nomination. But it would be no easy walk to win the White House against the Republican candidate, Vice President Richard Nixon (1913–1994). At that time, Kennedy was a controversial candidate because he was a Roman Catholic. Religious prejudice, or dislike of a person based solely upon his or her religion, probably cost him over a million votes in Illinois alone. Kennedy responded to the issue of religion in his "Houston speech" on September 11, 1960. He believed in the absolute separation of church and state (the belief that one body—church or government—would have no influence over the other). To him, this meant that no priest could tell a president what to do and no Protestant clergyman could tell his parishioners how to vote. In other words, Kennedy's religion would not affect the decisions he made as president. A series of televised debates with Nixon was crucial to Kennedy's campaign. Many viewers believed Kennedy defeated Nixon with his style. Kennedy showed the American people that he had a sense of humor, a love of language, and a sense of the past. On November 9, 1960, John F. Kennedy became the youngest man and the first Roman Catholic in American history to win the presidency. The 1960 presidential election was one of the closest in the nation's history. Kennedy won the popular vote by only 119,450 votes. On December 19, 1960, the electoral college cast 303 votes for Kennedy and 219 for Nixon. At the inauguration on January 20, 1960, the first U.S. president born in the twentieth century was sworn into office. Kennedy's inaugural address included the challenge: "Ask not what your country can do for you, ask what you can do for your country." In his short time in office, Kennedy faced many crises. The first of which involved Cuba, a country about ninety miles south of Florida. On April 17, 1961, fourteen hundred Cuban exiles, supported by the United States, invaded Cuba at the Bay of Pigs. On April 18 the Soviet leader Nikita Khrushchev (1894–1971) sent a note to Kennedy stating that his government would help the Cuban government resist an attack. By April 20 the invasion had failed. Although the plan for training Cuban exiles had actually begun during the presidency of Dwight D. Eisenhower (1890–1969), Kennedy took responsibility for it. He had first supported the plan but later refused to commit the necessary American troops. He was aware that if the Cuban people did not rise up and back the invaders, the United States could not force them to accept a new system of government. Although the Bay of Pigs invasion was a failure, it did prove Kennedy's ability to face a disaster. Kennedy continued to show skill and passion for issues at home, particularly civil rights. In 1961 the Congress of Racial Equality, a civil rights group, organized people to protest segregation, or the practice of separating people based solely on their race, on buses and trains. When the showdown came, "the Kennedys," as the president and his brother Robert, the attorney general, were known, sent six hundred Federal marshals to Alabama to protect these "Freedom Riders." In 1962 they sent hundreds of Federal marshals to protect the rights of the first African American student to attend the University of Mississippi. On October 22, 1962, Kennedy announced to the nation that the Soviet Union had sent nuclear missiles to Cuba. In response the United States had blocked all shipments of military equipment into Cuba. The United States would not allow Cuba to become a Soviet missile base, and it would regard any missile launched from Cuba "as an attack by the Soviet Union on the United States, requiring a full [military] response." For a week the details of the situation had been "the best kept secret in government history." Throughout the seven days, the Kennedy administration had maintained an outward appearance of normal social and political activity. Meanwhile, American military units throughout the world were alerted. Messages were sent back and forth between Kennedy, Khrushchev, and Pope John XXIII (1881–1963), who was volunteering as a peacemaker. During this time Soviet ships were moving toward the area of the blockade in the Atlantic Ocean. They slowed, then stopped. On October 28, 1962, the Soviet Union said it would remove its missiles from Cuba. One result of the crisis was the nuclear test ban treaty with the Soviet Union, which Kennedy called "the first step down the path of peace." The treaty was signed on July 25, 1963. A "hot line" for emergency messages was also set up between Washington, D.C., and Moscow, the capital of the Soviet Union. Vietnam, a country in Southeast Asia, took up more of Kennedy's time than any other problem. The Vietnam War (1955–1975) was a civil war in which anti-Communist forces in South Vietnam, supported by the United States, were fighting against a takeover by Communist forces in North Vietnam. In 1954 President Eisenhower had offered military aid to South Vietnam and funding, and advisors were sent to the country throughout the 1950s. Although Kennedy believed that a "full-scale war in Vietnam … was unthinkable," he tripled American forces in the country. Senator William Fulbright (1905–1995) suggested that Kennedy put troops in Vietnam to prove to Khrushchev that "he couldn't be intimidated." Kennedy was well aware of the dangers of the presidency. "Who can tell who will be president a year from now?" he would ask. On the day of his arrival in Dallas, Texas, he said that if anyone wanted to kill a president he needed only a high building and a rifle with a telescopic lens. That day—November 22, 1963—the president was assassinated. It is generally believed that Lee Harvey Oswald (1939–1963), using a rifle equipped with a telescopic lens, was the person who fired on the president's car. Others, however, believe more than one person was responsible. All of the United States—indeed, the world—was in mourning. In Indonesia, flags were lowered to half-mast. In New Delhi, India, crowds wept in the streets. Kennedy once summed up his time as "very dangerous, untidy." He lived through two world wars, the Great Depression (a period from 1929 to 1939 during which nearly half the industrial workers in the country lost their jobs), and the nuclear age. "Life is unfair," he remarked. And so it was to Kennedy, heaping him with both glory and tragedy. Yet, he never lost his grace, his sense of balance, or his optimism. What Kennedy accomplished was not as important as what he stood for. As the African magazine Transition expressed it, "murdered with Kennedy was the first real chance for an intelligent and new leadership in the world. His death [left] us unprepared and in darkness." 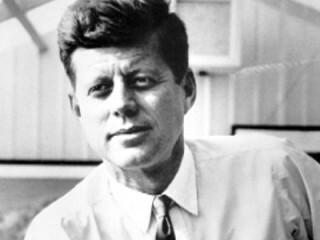 View the full website biography of John F. Kennedy.